Mojitos are always irresistible; this one is non- alcoholic and frozen, which makes it the best cool down drink after a run through the countryside. The original recipe will give you a granita that looks like a real mojito. If you want it pink like in the picture above, just before serving throw it into your blender with a couple of spoons of a berry sorbet. Mix water, sugar and the grated zest of 2 limes in a saucepan. Cook the mixture until the sugar is dissolved. Reserve 5 of the mint leaves, add the remaining mint to the saucepan and remove from the heat. Let cool to room temperature. Once cool strain the mixture in the container you plan to freeze the granita, pressing firmly on the leaves to extract the flavourful liquid. Discard the mint leaves. Stir in the lime juice and, optionally, the rum, then finely chop the reserved mint leaves and add them as well. 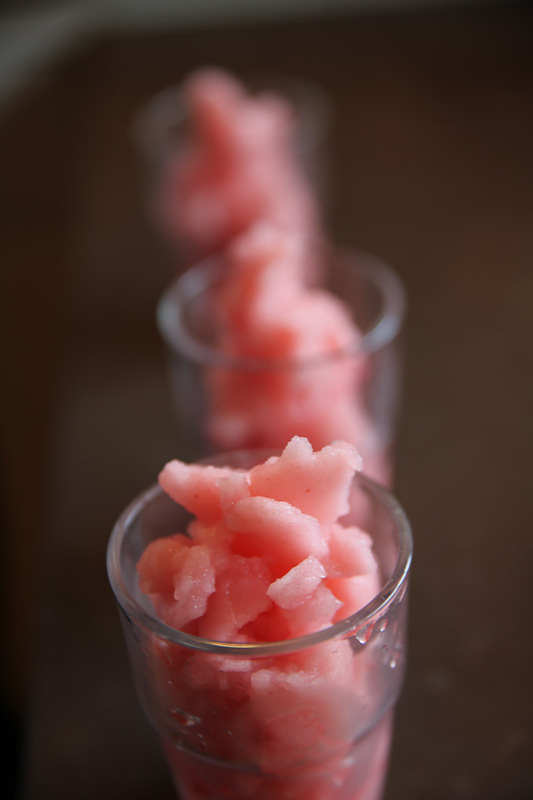 How to freeze a granita you find in my recipe for granita de caffé. smoothie and raw food combination tips!